LUCIANO BERIO (1925-2003): SOLO for Trombone and Orchestra, NINO ROTA (1911-1979): Trombone Concerto in C, GEORGES DELERUE (1925-1992): Madrigal for Trombone Ensemble (Trombone Unit), FRANK MARTIN (1890-1974): Ballade for Trombone and Piano (Eriko Takezawa [piano]), FOLKE RABE (b.1935): BASTA for Solo Trombone. Description: Berio's aptly named SOLO is very much that, rather than a concerto in the conventional sense; the soloist plays a continuous stream-of-consciousness soliloquy involving complex extended techniques - multiphonics, various unusual trills - while the orchestral brass chime in periodically to shadow or echo the solo part, producing a kind of virtual instrument with several voices. The orchestra, meanwhile, weave an independent tapestry of exotic sound around the solo line, framing and punctuating it without interacting with it in the usual concertante sense. Rabe's BASTA is a brief, pungent cadenza-like piece, brusque and tense. Delerue's attractive, Romantic Madrigal is melodically and harmonically rich, a good companion for the familiar Martin. Rota's appealing neoclassical concerto - very much the standard concerto format despite its unorthodox solo instrument, in direct opposition to the Berio - rounds out this nicely balanced and varied disc. 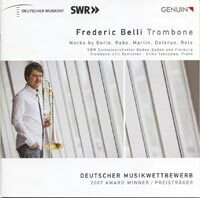 Frederic Belli (trombone), SWR Symphony Orchestra Baden-Baden and Freiburg; Sylvain Cambreling, Pablo Heras Sasado (Rota).